With Spring Break rapidly approaching, I wanted to take time out to put together an exhaustive guide of some of the fun, free and/or inexpensive things you can do with your kids in the South Sound! Our family is personally sticking around this year for Spring Break (no Hawaii excursions here! ), so compiling this list is one part personal agenda/one part help for you (I hope!). 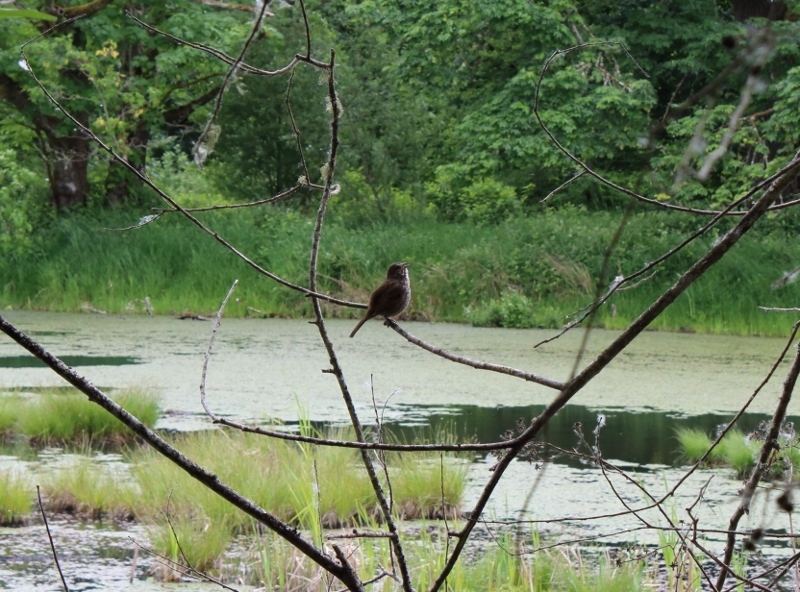 Nisqually National Wildlife Refuge (Olympia, WA). Now named Billy Frank Jr. Nisqually Wildlife Refuge. One of my family’s personal favorite places to visit (pictured above)! Miles of trails through the forest and over a boardwalk. Lots of bird and wildlife viewing. Earn a free Jr. Ranger Patch for kids. Cost: FREE, but requires parking fee or permit (you may be able to check out from your library). Read my post for more information. Hylebos Trail (Federal Way, WA). Awesome spot to explore year-round! Look for bunnies, salamanders, frogs, snakes and more. Extensive flat boardwalk trail, making it a good nature walk choice for families. Pack a lunch and use one of the benches! Cost: FREE. Read my post for more information. Discovery Park (Seattle, WA). 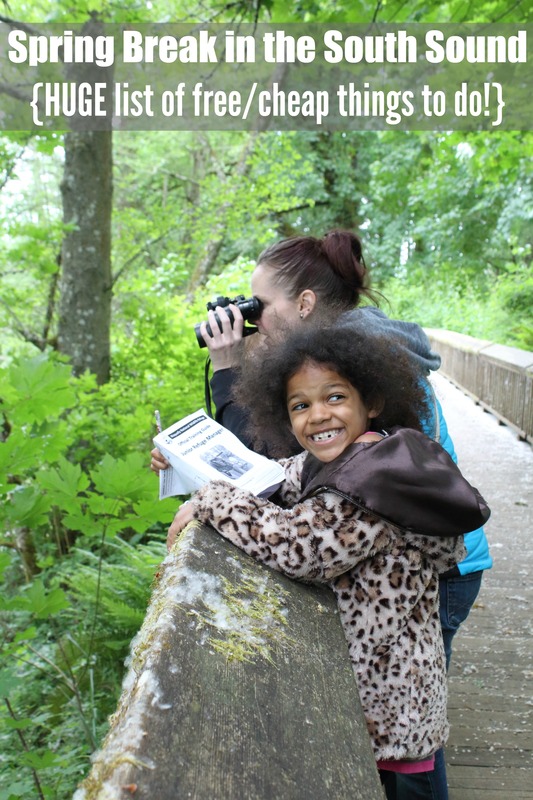 500+ acre natural area – the largest park in Seattle! This place has it all – from beaches, to meadows, forested trails, sand dunes, streams and much more. Go bird-watching, explore tide pools, let the kids play for awhile at the playground, or pack the bikes and go biking around. Cost: FREE. Ride a Ferry (Pierce County, WA). Want something fun and a bit different to do? Pack a sack lunch and hop aboard a ferry at Steilacoom! Since we’re at non-peak times of the year, you’ll save even more. A child’s passenger-only ticket is just $3.25 per round-trip trip and adult is $5.45. Of course, this is assuming you’re walking on (not taking a car). Adding a car is $18.35 which includes the driver’s fare. Purchase online. Proctor Farmers Market (Tacoma). Regular season starts March 23rd (Saturday) from 10 am – 1 pm. Cost: FREE! Head to the Beach (Various locations). We’ve found that not a lot of folks head to the beach this time of year, making it a cool spot to visit without a crowd. My kids and I love Dash Point Beach (Federal Way/Tacoma), but Owen Beach at Point Defiance is another good option. One of the most memorable beaches we’ve ever visited is Penrose Point State Park. Make a sandcastle or consider a “beach-combing bingo” where your kids try to find objects like crabs, sand dollars and seaweed. Cost: FREE, of course (however, some locations may require a Discover Pass). Tacoma Nature Center (Tacoma, WA). 71-acre nature preserve around Snake Lake. Would you believe I’ve yet to take my kids here? I think we’ll be adding this to our personal “Spring Break to do” list! Cost: FREE, but donations are accepted/appreciated. Mima Mounds (Olympia, WA). We visited this quirky spot a few years ago and I think it would make a great option for a day trip. It’s hard to describe this place, but it’s a very bizarre natural wonder. Picture a bunch of mini “hills”. There are a number of walkways and in the spring, there are lots of wildflowers. I encourage you to read my post about our visit for more information. Requires a Discover Pass. Take a Hike (Various locations). If you’ve got the time and ability, head to the Olympics, Mt Rainier, or the North Cascades. But if that’s out of the question, you could head to a closer, nearby trail. (Check out the Washington Trail Association for a list of best hikes for kids, stroller-friendly trails, interpretative/nature hikes and more.) Last Spring Break, we visited the Hoh Rainforest in the Olympics and my kids declared it one of their favorite places ever. Bonus: pack this book on Plants of the Pacific Northwest Coast (Amazon link) and see how many plants and trees you and your kids can identify. Cost: FREE, but some locations may require a parking permit or entrance fee. Capitol Building (Olympia, WA). My family has been here more times than I can count! It’s free, it’s not hard to find free parking, plus there are lots of nearby parks and restaurants so you can make a day of it. Join a free tour, ask for a free coloring book for kids at the front desk, and get a free Capitol Building passport stamp! Free Building Event for Kids at Home Depot (multiple locations). Build a FREE birdhouse at Home Depot on Saturday, April 6th. Cost: FREE, but requires online registration. Hit the Library (Various locations). What more needs to be said here? Hit the library early in the week and stock up on books! For fun, pick a branch you don’t normally attend. Also, see if your library checks out museum passes (I know King County and Pierce County library systems do!). Tinkertopia (Tacoma, WA). One of my kids’ very favorite places to play (pictured above)! 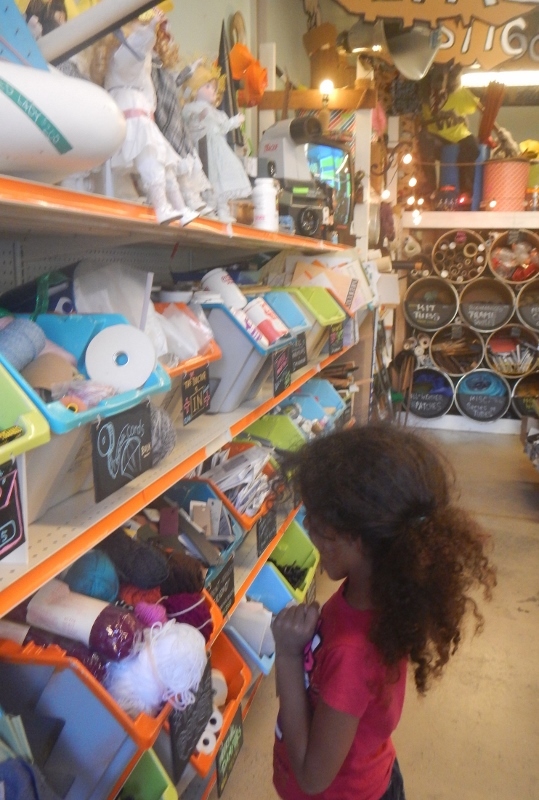 $7 gets you 90 minutes and the use of all the materials in the “tinker” space. I consider this a real deal! Make sure to check the calendar and/or phone ahead as the tinker space is sometimes reserved for private parties and classes. Read my post for more information. First Thursday Art Walk (Seattle, WA). On the first Thursday of every month, you can tour art galleries for free between the hours of 6 pm – 8 pm! (There are others that happen monthly around the greater Seattle area, too.) On this day, you can also get FREE entry to the Seattle Art Museum (some exhibits may be excluded). Visit a Museum (Various locations). While most museums have admission fees, some are free – and other museums you can visit on specific days to get free and/or discounted entry. Don’t forget to check with your local library for passes you can “check out” as well. For tips on this topic, please see the huge post we compiled about when to visit Seattle-area museums for free. Recently, I also shared about lesser known Tacoma-area museums you can visit for free. Visit a Lighthouse (Various locations). We have a number of beautiful lighthouses here in Washington State! Here is a list of some of the ones you can find and visit. If you’ve got your hopes up about going inside one, I do encourage you to do your research ahead of time as some may not be open to the public, or only have certain hours. Pacific Bonsai Collection (Federal Way, WA). Located at the Weyerhaeuser offices. You can also visit the Rhododendron Gardens. Admission to both is free. There are also some lovely walking trails nearby. Spring Break Camps (Tacoma locations). Metro Parks is offering a number of Spring Break Camps the week of April 1 – 5th for kids ages 6-12. Cost and location varies; see Metro Parks Tacoma for details. Pump It Up (Kirkland, Lynnwood & Tacoma, WA). Lots of fantastic indoor play! Massive indoor bounce houses and slides. See individual locations for drop-in times and availability. Odyssey (Tacoma, WA). 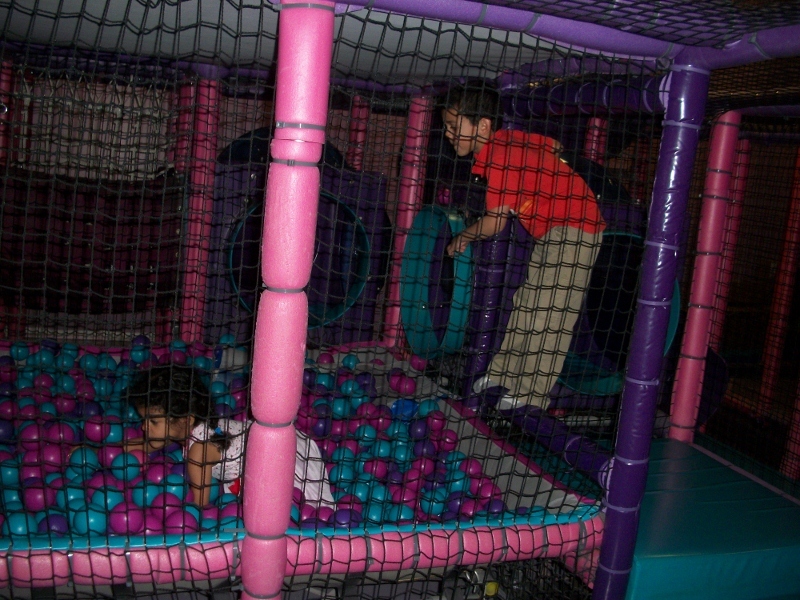 Amazing indoor play area; one of my kids’ favorites (pictured above). Plus, they’ve got lots of seating for the parents and FREE Wifi. It’s a few bucks for each kiddo. They also have an arcade and laser tag. See the website for more. Children’s Museum of Tacoma (Tacoma, WA). Great indoor fun, especially for the younger set. Hands on learning, imaginative play, art and science activities. Cost: suggested donation, but if you’re not able to make one, they won’t turn you away. Tip: to save on parking, park for free at the Tacoma Dome Station and ride the Link (also free). It lets you off mere blocks from the museum! Federal Way Community Center (Federal Way, WA). This is my kids’ favorite community pool in the area! It has several areas for swimming, plus a large water slide and lazy pool area. A good option particularly when the weather may not be so predictable. Make sure to check ahead on the schedule! Cost: adults, $8; kids 0-2, free; kids 3-11, $5; kids 12-17, $6. Cheap Movie Theater (Federal Way, WA). In the past, this theater offered tickets as low as $2, but right now I’m seeing prices hovering at $3.99. (Still cheaper than the average theater and worth a mention, in my book). What you’ll typically find here are movies that have been out for awhile. For instance, right now I see that Wreck it Ralph II and The Lego Movie II are playing. Debbie Dolittle’s Indoor Petting Zoo (Tacoma, WA). Too rainy or cold for the zoo? Try this unique indoor petting zoo instead. While I’ve yet to visit myself, I’ve heard many friends rave about this place. 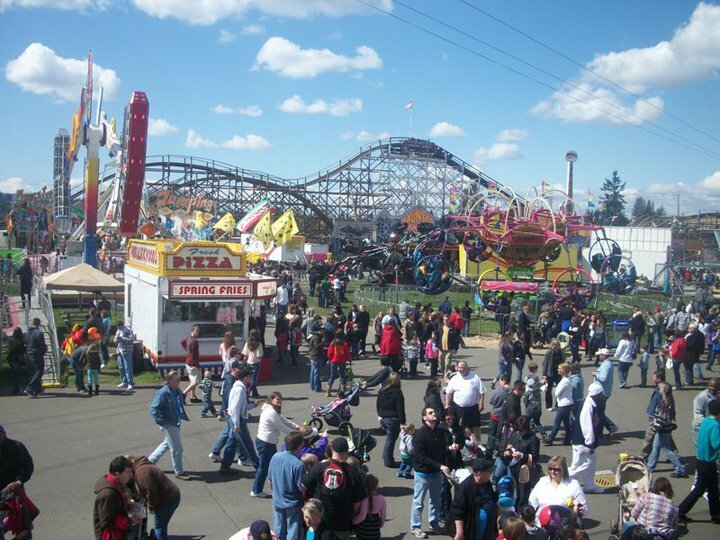 Spring Fair (Puyallup, WA). For those with later spring breaks, you might be interested to know that the Spring Fair runs April 11 – 14th this year. One way to save? Visit on opening day, when kids get in for FREE after 2 pm with a suggested non-perishable food donation! See the Fair’s website for additional information and ways to save. Pioneer Farm Museum (Eatonville, WA). Great little place to experience pioneer life with the kids! Includes tour. 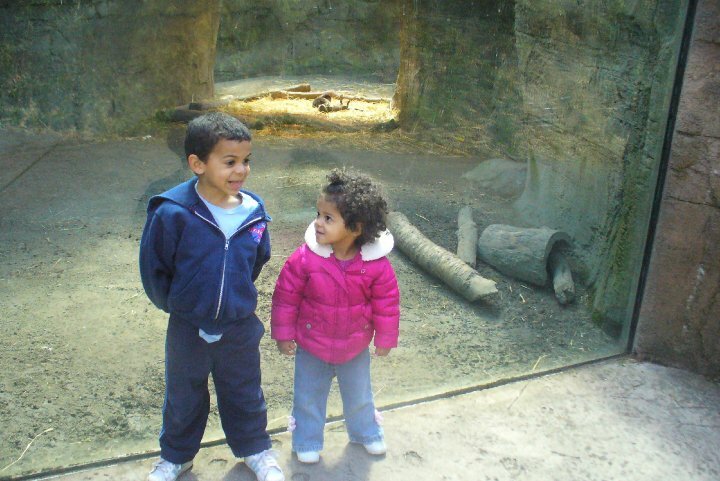 My kids loved our visit several years back. Visit a Park (Various locations). Kind of a no-brainer here, but parks are always free and fun to visit. To keep things spicy, consider visiting one in a nearby city you’ve not spent any time at before. Some of my favorites – Chambers Creek (University Place), Wright Park (Tacoma), and Norpoint Park (Tacoma). See the following for more: Metro Parks Tacoma, Puyallup Parks, Seattle Parks, Auburn Parks & Trails, Olympia Parks. Free Programs at Point Defiance Park. Speaking of parks, Tacoma’s premier park has a number of free programs! I’m seeing an event all about slugs on March 30th (I mean, that has kids written all over it!) as well as a couple ranger-led programs on April 6th and 7th. While these are free events, registration is required to save your space. Head to Metro Parks on Facebook and visit the Events tab for more. Tulip Festival (Skagit Valley, WA). Take a drive up to visit the beautiful tulips of Skagit Valley! It’s free to drive up and take some awesome spring portraits of your kids! My family always likes to make a day of it by strolling around LaConner and grabbing a bite to eat at one of the local diners. I do recommend keeping an eye on the website when planning your trip to make sure the tulips are in bloom when you’d like to go. Rent a Canoe at UW’s Waterfront Activities Center. This is one of my kids’ very favorite things to do. You can rent a canoe for about $6 per hour (paddleboats also available) and head out to the Arboreteum. We always find cool wildlife on our adventures – like herons, eagles, turtles, baby ducks, and more. Highly recommend this adventure! Read my post for more details and pictures. I wanted to include some of my family’s favorite spots to visit that may not be as frugal as the ideas listed above. Note that there may be ways to save on admission to some of these places! Point Defiance Zoo & Aquarium (Tacoma, WA). Always a local favorite – and one of my family’s favorites, too (pictured above, when my kids were SO LITTLE – WAH!!)! During the month of April, they’ll be running an Aquarium Community Celebration. Cost: not cheap, but if you’re local, I encourage you to consider an annual family membership. If you go as often as my family does, it really does drive the cost down of each individual visit! Northwest Trek (Eatonville, WA). Spring break would be a great time to pay Northwest Trek a visit! Their relatively new Kids Trek area is a half-acre, $1.9 million expansion and it’s free to visit with your Northwest Trek admission. Woodland Park Zoo (Seattle, WA). Cost: as with Point Defiance, it’s not cheap, but may be worth considering an annual membership. Pacific Science Center (Seattle, WA). Lots of hands-on, interactive play, butterfly house, and more. Located in the heart of the Seattle Center, where there are additional things to do. One of the more “splurge-y” items on this list. Theo Chocolate Factory Tour (Seattle, WA). Got kids ages 6 and over? For $10, you can tour the Theo Chocolate Factory in Seattle! The tour promises lots of samples! Got kids younger than that? They offer a 45-minute tour for the younger set for $8 each. Book your tour online. While I’ve done my very best to include as many fun ideas as possible, I know I’ve likely missed some ideas in my research. What would you add to my list? Please do leave a comment below. I hope as readers find and share this list, they’ll make sure to scour the comments for additional gems. Thank you for this list. I knew about many of these and there were a lot of new ones to me. We will definitely be checking at least one out over Spring Break and I book marked the list for future use. I probably should make a checklist for easy reference for those days this summer just need to try something new. Thanks for such a great and extensive list of options! Tons of super ideas! Skate Tiffany’s in Puyallup has two weeks worth of daily deals for Spring Break – April 1-5 & 8-12th. King Mini Golf has daily Tee Times as well for both weeks to accommodate all the different District Schedules.